First let's create a form interface with a textarea input and a button. User has to enter a bunch of text and click on 'Convert' button. Then our JS function will detect URLs from the text and replace the plain URLs with clickable links. Next we need to write the java script function that takes up the user input, parse, find and replace the text URLs with hyperlinks with the help of regular expression patterns and return the converted text. Add the above script to the index.html file. The function toHyperlink() will do a two-step pattern match. First it will find the links starting with http / https / ftp / file and replace those with hyperlinked texts. Next it looks for urls that start with www and replace those with clickable links. 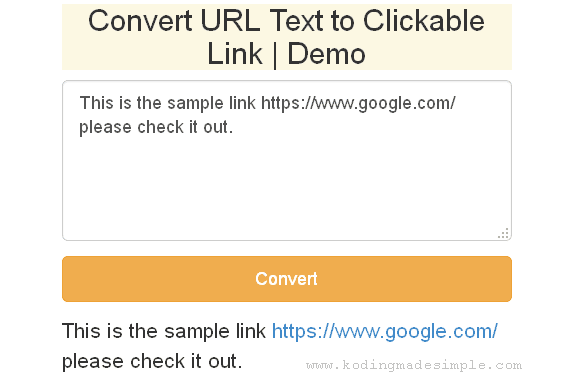 Now run the file and enter some plain url text in the box provided and click 'Convert'. 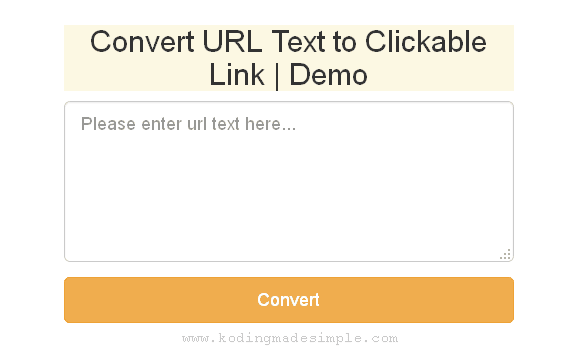 Our JS function will do its magic and you will see converted text with clickable links below the form. That was all about converting non-clickable url into hyperlink with java script. Regular expression is a powerful weapon and you must make sure to use it properly. I hope you like this tutorial. Feel free to customize the code according to your preferences. And please don't forget to share it on social networks.